The movement quality is determined by balance mass, material and workmanship quality, and transmission ratio. Our fitness experts have summarized and pre-selected all important facts for a high movement quality here. Filter according to the movement quality to choose ergometers with especially comfortable courses of movement. Ergometers for home use are designed for private use. Semi-professional ergometers are designed for a longer operating life and can also be used at hotels, clubs, and for company's fitness. Ergometers of commercial quality are best for professional use at gyms and for a very long operating life. Semi-professional and professional ergometers are also excellent for home use due to their high-grade material quality. A deep step-through allows a very easy getting on and off an ergometer. A deep step-through is recommendable especially for older users and persons with physical constraints. 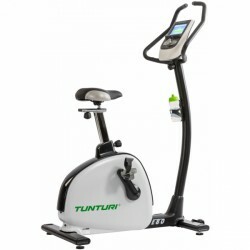 The Tunturi exercise bike Endurance E80 is the flagship of the new Tunturi exercise bike series. With its Full Color TFT-LCD display, the easy-to-use console, and the valuable components, the Endurance E80 offers a great training experience. The resistance can be set up to 600 Watt and is generated via a silent and reliable induction system. The deep step-through as well as the adjustable handlebar and saddle provide a high level of comfort and good training ergonomics. 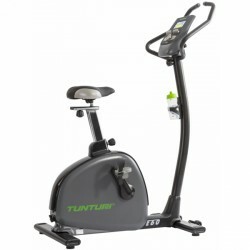 The Tunturi exercise bike Performance E60 is equipped with an induction brake sysetm, which is very silent and also has less parts of wear and tear. The induction system provides a maximum resistance of 440 Watt and is hence also best for advanced and ambitious users. The console is easy to understand and offers 20 training programmes. Via Bluetooth, you can connect the machine with a tablet or a smartphone. 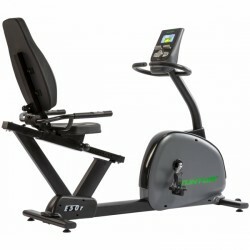 The Tunturi recumbent bike Performance E50-R is a good machine at a fair price-performance ratio with its deep step-through and the Performance console. The adjustable resistance of up to 350 Watt is generated via a magnetic brake system and gives enough space for a well-balanced or intensive training. The console is equipped with 20 programmes and the option to connect the machine with a tablet or a smartphone. 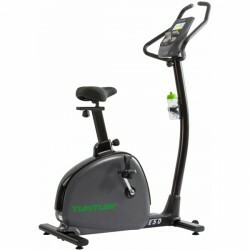 The Tunturi exercise bike Performance E50 is a beginner exercise bike of the new Tunturi Cardio line. Offering 32 resistance levels and a maximum wattage of 350 Watt, you can do an intensive traiing and enjoy the advantages of the console. An easy and intuitive control allows for a quick adjustment of your training plan. The equipment adjusts automatically the resistance according to your settings. The Finnish fitness pioneers have set new standards in the current fitness world with the development of their exercise bikes. Offering a high level of stability and safety, the products of the Pure Series convince. The ergonomic shape prevents signs of fatigue and physiological false postures. 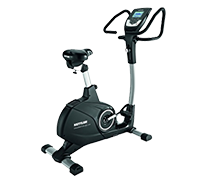 The inventors have put a great importance on a deep step-through as well as a low pedal space, so that you can comfortably train on your exercise bike. The models Pure Bike 6. 1 and the Pure Bike 10.1 of the Tunturi Pure Bike serie mainly stand out. They are equipped with a precious design and all important attributes for a varied and intensive training. Furthermore, these models offer the patented T-Ride™ and T-Road™ functions, which are solely included in the top models of Tunturi. These programmes give your training even more diversion and give you a real outdoor feeling during the workout at home. The Pure Bike 6.1 and the Pure Bike 10.1 of Tunturi are perfect for ambitious home and leisure sportsmen.